Nedanstående text är från en sommarkurs i English Composition and proficiency. Tack Fredrik Pettersson för det intressanta bidraget! In the late seventies I remember teachers and newspapers prophesizing about chartered trips to the moon and colonies on Mars. In the years before and following Neil Armstrong’s famous small step for man and giant leap for mankind, space became the last frontier, and man was destined to boldly go where no one had gone before. It is now 2003 and Voyager 1 and 2 are drifting in space like stray cats. NASA predicts that in 20 years, they will still be some 12.4 billion miles from the Sun (http://voyager.jpl.nasa.gov/mission/interstellar.html). Columbia is scattered over Texas, MIR has been put to rest, and human touchdown on Mars still seems like a pipedream. Ever since the first outward expansions of Europe, beginning with the Vikings till the space race, and the raising of the American flag on the moon, all significant earthly– and stellar—explorations, have been fuelled by the quest for gold or power. And this is probably also the reason why the exploration of space has stalled in the last few decades. It could be argued that the major European expeditions during the Age of Exploration were motivated by religious interests wanting to civilize “those who were in darkness” (Buckler 518), but as the sixteenth century diplomat Ogier Gheselin crassly pointed out: “religion supplies the pretext and gold the motive” (Buckler 520). And if the early expeditions were merely a means to find new resources, trade goods and gold, the latter part of the 19th century was simply a frantic quest for prestige and power. This culminated with the “race for Africa”, and ended with the emancipation process of colonies following the upheaval of the Second World War. But exploration (and exploitation) as a weapon in wars for prestige did not end there. Instead, the new mortal enemies the Soviet Union and the USA began the space race. Some will undoubtedly say that recent technological inventions, which made space exploration possible and a growing scientific interest in space in general were the prominent factors that lead to the conquest of the moon. But most people will agree that science supplied the pretext, the ideological cold war between communism and American capitalism the motive. It was considered a disaster in the USA when the Russians managed to send the first rocket into space, and when the first man to leave the atmosphere was a Russian cosmonaut by the name of Juri Gagarin, America found itself in a state of shock. If the communists proved able to win the space race, then they could probably win the ever growing arms race as well. During this cold war hysteria, Kennedy stepped forward and sturdily proclaimed that America would be the first nation to put a man on the moon. Up to this point the moon had been regarded as a dead rock hanging in the heavens, now it became a battlefield for power and prestige, a stepping stone for ideological superiority. Whoever made it there first would prove the supremacy of its political system to the rest of the world. Space became a source for points of prestige, and billions of dollars and roubles were spent on this project. For several years, the world witnessed endless amounts of resources, money and human sweat being poured into the race. The astronauts of the Apollo project became heroes; they were rock stars in space. America held its breath as Apollo 13 made its crooked way back to earth, and Gus Grissom and crew were mourned by an entire nation. 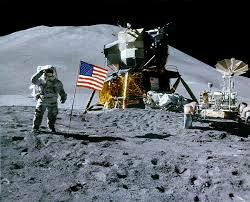 And naturally, the first man on the moon, Neil Armstrong, became an icon all over the planet. After the moon had been conquered by the Americans, the public and the government, gradually lost interest in the Apollo project which was subsequently cancelled–space exploration fell into oblivion. The costs to explore space further were considered too high. The communists had suffered a great blow in the race for the moon, now it was time to beat them in the arms race down on earth as well. The space industry that had been charting the way towards the future, with its technological innovations and scientific breakthroughs in general lost its momentum and has now been surpassed mainly by the military. And the entertainment industry has become the brightest star in developing new computer technology. The space program is of course not totally laid to rest, but since the Viking mission to Mars (which failed to reveal anything revolutionary) NASA has been out of focus. Space has instead been reduced to a media circus. Popstars and billionaires line up to be shuttled into space, and documentary shows let common people compete for a seat on a space shuttle. And the public in general seems more interested in whether Michael Jackson will go to space than if there is life on Mars. probably continue to be so for a very long time. It seems as if the agenda to place colonies on Mars or arrange chartered trips to the moon have been lost. And even more importantly, the incentive to penetrate even further into space seems gone. But, perhaps the space program would be better funded if we were to find gold instead of life on Mars? Or perhaps the scientific space community would be funded more if the western world once again found a deadly foe here on earth they could compete with for points of prestige? Buckler, McKay, Hill. A history of world societies. Boston: Houghton Mifflin Company, 1996. An explosion in one of the oxygen tanks of Apollo 13 during its flight to the moon made the spacecraft almost unable to return. Only after it had gained speed from the gravitation of the moon could it gain enough momentum to head back to earth. Gus Grissom – the second man in space – and his crew consisting of Ed White and Roger Chaffe were killed on Jan. 27, 1967, in a fire accident during their testing of Apollo 1. According to many experts the Russians actually managed to take the lead in the arms race in the late seventies. But all that changed with the election of the republican President, Ronald Reagan, who immediately put an enormous focus on the arms industry.